In September 2015 the United Nations General Assembly formally adopted the Agenda 2030 for Sustainable Development, an action plan consisting of 17 Sustainable Development Goals (SDGs). 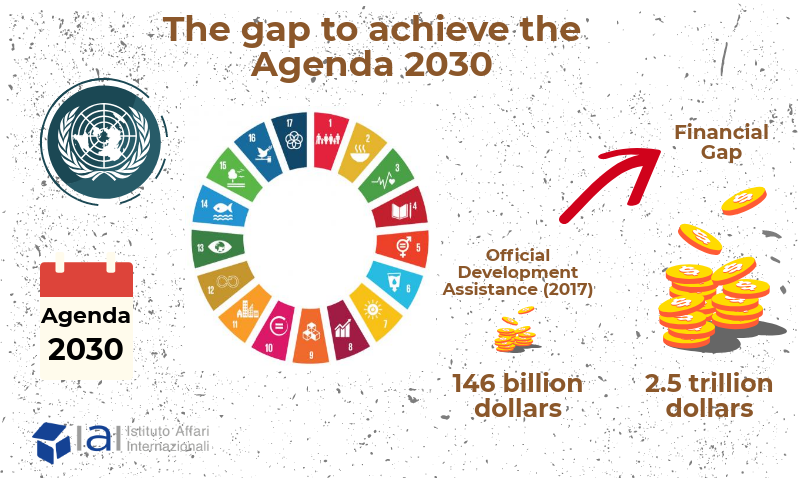 These targets represent an expanded and updated version of a previous set of UN goals, known as the Millennium Development Goals (MDGs), which ended in 2015. IAI elaboration on OECD figures. See OECD, Launch of ODA Figures 2017, 9 April 2018, http://www.oecd.org/development/launch-of-oda-figures-2017-france-april-2018.htm. Over the last years, many companies have opted to publicly endorse and subsequently pursue – in a more or less genuine way – the targets included in the SDGs. Corporate Social Responsibility activities as well as annual reporting on economic, social and environmental performances have become a cornerstone of the work of major business groups. While some have criticized these actions as simply self-serving from a publicity and financial point of view – what is sometimes referred to as “greenwashing” – the spread of such activities and greater public and political scrutiny of value chains and production cycles is slowly making a difference. Such instruments have become essential to increase the value of companies and their activities, in particular due to the increasing attention paid by investors towards sustainability performances. 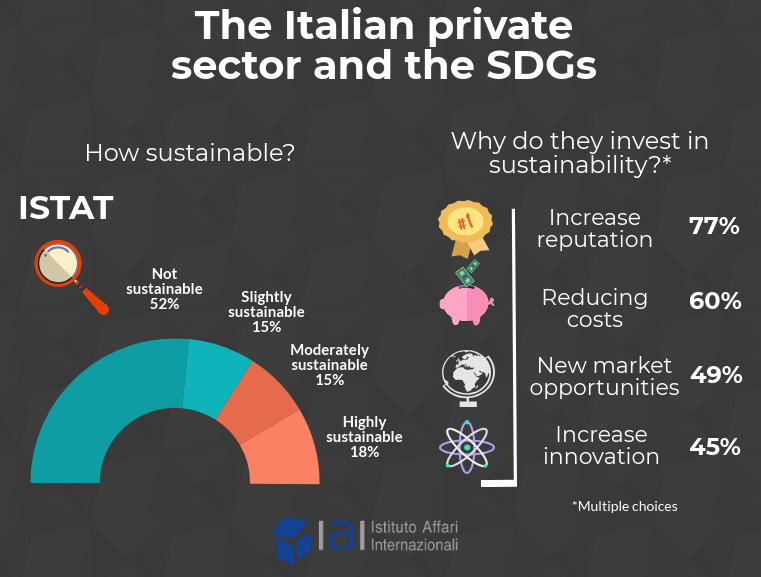 In Italy, for instance, the General Confederation of Italian Industry (Confindustria) has recently published a Sustainability Manifesto that highlights the private sector’s key role and ability to mobilize economic resources, and to make the Agenda more tangible for ordinary citizens. In this sense, a very interesting initiative is the so called “Sustainability Map”, a ranking of Italian companies that respect a series of environmental, human and ethical standards. The initiative has already gathered 250 companies and is an exercise that may produce positive spill-over effects, given the increased visibility and opportunities associated with being included in such ranking. IAI elaboration on ISTAT figures. See ISTAT, Rapporto sulla competitività dei settori produttivi - Edizione 2018, 23 March 2018, p. 50-53, https://www.istat.it/it/archivio/212438. On the other hand, there is a problem of indicators: the global indicator framework adopted by the UN General Assembly in 2017 is too broad – consisting of 232 indicators – making it difficult to quantify and communicate progress on sustainability matters. For this reason, the current reporting system risks becoming a mere auditing procedure, that does not necessarily generate incentives for substantial changes in business models and value chains. In Italy, however, support and commitment from the new government remains vague and lukewarm at best. The same is true regarding efforts to include and engage the private sector in the process. While some initiatives have materialized over the past months – the publication of a National Sustainable Development Strategy (NSDS) being one prominent example –, what the country truly needs is a more resolute strategy, one that rests on the key involvement of small, medium and large enterprises. Italy’s so called “Industry 4.0 Plan” – adopted under the previous legislature – has only marginally linked innovation with the circular economy. A real breakthrough will occur only if the current economic system is converted towards the digi-circular economy, thus employing new technologies to limit waste and promote sustainability. In this respect, the plan should work in synergy with Italy’s national Digital Strategy in order to strengthen linkages between research and development and the private sector. In other words, the plan needs to exploit the unprecedented potential stemming from new strides in technological innovation. The new government will also have to rectify some past errors, the most significant of which regards the implementation of EU Directive 2014/95 on financial reporting. Italy decided to interpret the law in a very restrictive way, imposing the new system only on big companies, a decision that has caused important repercussions for small and medium-sized enterprises (SMEs). 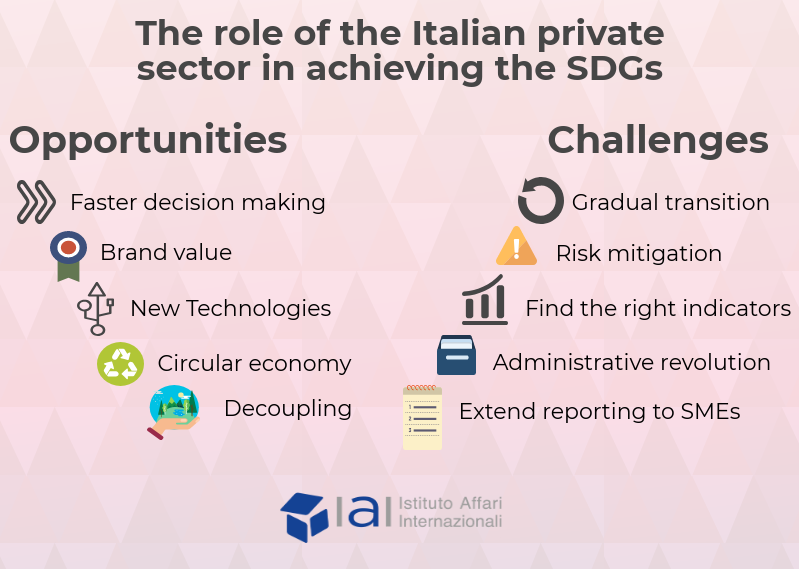 Italy’s newly established National Commission for Sustainable Development is set to play a crucial role in these processes. The Commission will not only advise and direct government policies but also accompany local authorities (i.e. regions and cities) in this long-term transition process. The struggle for sustainability, in fact, largely depends on a truly bureaucratic and administrative revolution that goes hand in hand with political decisions and private sector initiatives. It will not be an easy battle, and the way forward is still very long, but fortunately, Italy can take advantage of a broader network of actors that strongly advocate the realization of this paradigmatic shift. These targets are linked to each and every SDG. For a more detailed analysis please cf. the website of the UN Division for Sustainable Development Goals: Sustainable Development Goals, https://sustainabledevelopment.un.org/sdgs. Greenwashing practice is adopted to make the company look more environment-friendly than it actually is, by spending more money, time and efforts on marketing its products as “green”, rather than actually minimizing its adverse impact on the environment. For a more detailed literature review please cf. Priyanka Aggarwal and Aarti Kadyan, “Greenwashing: The Darker Side of CSR”, in Indian Journal of Applied Research, Vol. 4, No. 3 (March 2014), p. 61-66, https://www.worldwidejournals.com/indian-journal-of-applied-research-%28IJAR%29/articles.php?val=MzMxMQ. Confindustria, La responsabilità sociale per l’industria 4.0. Manifesto di Confindustria per le imprese che cambiano per un paese più sostenibile, 24 January 2018, http://www.confindustria.it/wps/wcm/connect/www.confindustria.it5266/b12b1f8a-f7ea-4ad0-948b-951b862da92a/Manifesto+La+responsabilità+sociale+per+l’industria+4.0.pdf?MOD=AJPERES&CONVERT_TO=url&CACHEID=b12b1f8a-f7ea-4ad0-948b-951b862da92a. See the official website: La mappa della sostenibilità, http://www.mappadellasostenibilita.it. See the UN Statistics Division website: SDG Indicators, https://unstats.un.org/sdgs/indicators/indicators-list. Italian Ministry for Environment, La Strategia nazionale per lo sviluppo sostenibile, October 2017, http://www.minambiente.it/pagina/la-strategia-nazionale-lo-sviluppo-sostenibile. See also Italian Ministry for Environment, Voluntary National Review 2017, July 2017, https://sustainabledevelopment.un.org/memberstates/italy. Italian Ministry of Economic Development, Italy’s Plan “Industria 4.0”, January 2017, http://www.sviluppoeconomico.gov.it/images/stories/documenti/INDUSTRIA-40-NATIONAL%20PLAN_EN-def.pdf. See also Italian Ministry of Economic Development, National Industry 4.0 Plan (Impresa 4.0), March 2018, http://www.mise.gov.it/index.php/en/202-news-english/2036690. Italian Government, Strategia per la crescita digitale 2014-2020, 3 March 2015 (updated 21 June 2016), https://www.agid.gov.it/it/node/1257. Directive 2014/95/EU of 22 October 2014 amending Directive 2013/34/EU as regards disclosure of non-financial and diversity information by certain large undertakings and groups, https://eur-lex.europa.eu/legal-content/EN/TXT/?uri=CELEX:32014L0095. Italian Government, Indirizzi per l’attuazione dell’Agenda 2030 delle Nazioni Unite e della Strategia nazionale per lo sviluppo sostenibile, 16 March 2018, http://www.gazzettaufficiale.it/eli/id/2018/06/15/18A04116/sg. See the official website of the Italian Alliance for Sustainable Development (ASviS), http://asvis.it/asvis-italian-alliance-for-sustainable-development.